In order to effectively tackle higher-level mathematical problems, it is essential that children know their multiplication facts off-by-heart. This frees up the brain to focus on more advanced concepts. However, anyone with children in primary school knows how many children struggle with their times tables. The 60-Second Sweep game is a fantastic way to reinforce these maths facts. The game comprises a honeycomb containing 31 numbers or products that represent all 36 pairs of factors possible using the numbers 2 to 9. Each of these numbers has one pair of factors, with the numbers in the middle row having two pairs. The goal is to ‘sweep’ through the factors of each number in 60 seconds or less. What I like about this game is that it simplifies multiplication practice. 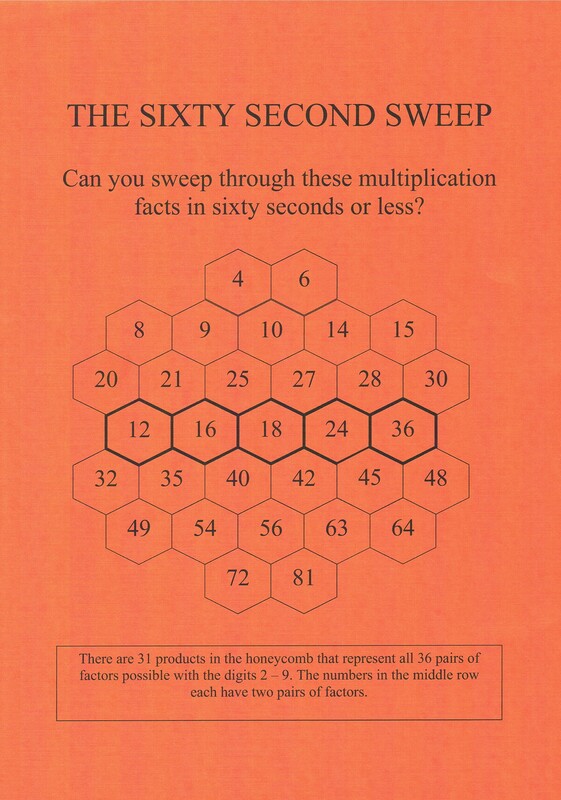 As there are only 31 numbers or products in the honeycomb, you can practice all the multiplication facts from 2 to 9 very quickly. This somehow seems less overwhelming that taking out the tables book to practice each one in turn. You can see videos demonstrating how to play the game here and here. Once you feel confident saying each factor, you can start timing yourself, each time aiming to beat your previous score until you reach the goal of 60 seconds or less. It is quite tricky at that start. Let me rephrase that – I found it quite tricky at the start! I am currently at 74 seconds. I am hoping that I get to 60 seconds before one of the children in my Maths Genius class does!